Lamins, like actin, belong to that class of proteins that are major building blocks of cell structure. Lamins are intermediate filament proteins, long and stringy, but unlike actin or tubulin, they have no polarity so motors like myosin, kinesin, dynein, can’t walk on them. Also unlike actin and tubulin, intermediate filaments are not dynamically unstable, so once assembled they are STRONG, thus comprising a considerable portion of very familiar body parts – skin, hair…and less obviously to the naked eye, mesh-like structures that hold organelles in place and knit cells together into tissues and organs. Lamins are the less sociable members of the intermediate filament family; they do not live outside the nucleus. They form a mesh-like structure (the nuclear lamina) that underlies and supports the nuclear envelope. An ever-expanding menagerie of additional proteins interact with lamins, chromatin, the nuclear envelope, making connections with the cytoskeleton to regulate nuclear structure and position. Lamins are also ancestral; all the familiar cytoplasmic intermediate filaments can trace their evolutionary origins to lamins. 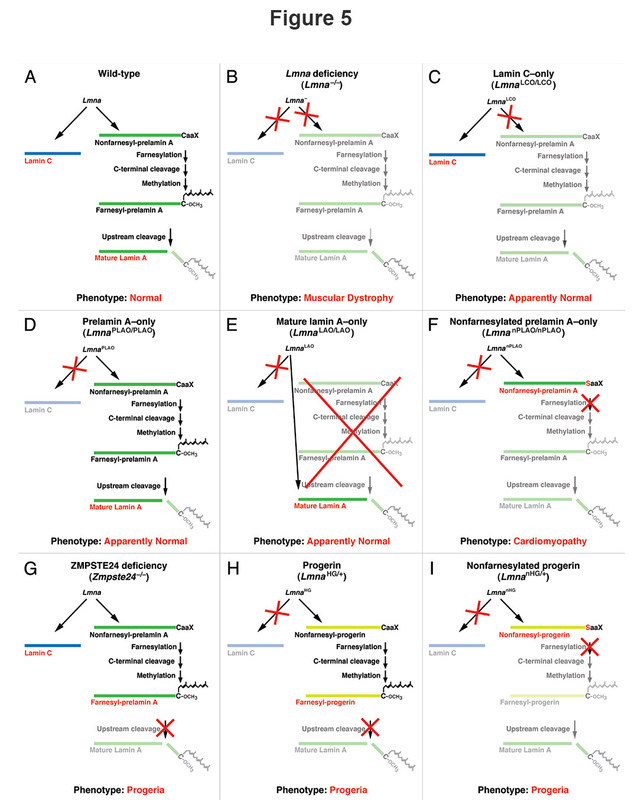 Figure 1 is a useful figure that summarizes lamin evolution, from a marvellous lab website that has lots of information about intermediate filaments (among other things). As you might expect considering the ubiquity and importance of structural proteins, mutations in intermediate filaments cause a number of god awful diseases. Here is a review: PMID: 19587450; in fact the whole issue is devoted to intermediate filaments and disease, including diseases arising from mutations in lamins, so-called laminopathies. These are rare, but remarkably numerous and predominantly tissue-specific diseases – perhaps because lamins play important roles in organizing a nucleoskeleton to maintain proper differential gene expression (one hypothesis among many). Among the most distressing of these diseases is Hutchinson Gilford Progeria Syndrome (HGPS) – a disease of rapid, premature aging affecting children, who do not usually live beyond their teens. HBO produced a remarkable documentary about this illness, profiling the life a boy named Sam Berns (“Life according to Sam”) whose parents were doctors, struggled to find a cure or a treatment as their son aged at approximately four times their rate. Disease always brings a biologist back to earth. The biological puzzles are fun but really the goal has to be finding a way to treat or cure people experiencing the not-so-maternal side of Mother Nature. But to understand how HGPS develops, you have to set aside the human stories for a while, and delve into the rather thorny biochemistry of lamins. Because I have a lot of experience explaining and re-explaining this complex stuff and doling out Kleenexes for all the resulting nose bleeds, I have learned that a just-the-facts-ma’am point form approach is rather useful, so here goes. Lamins – and the nuclear lamina they form – appear to be confined to metazoan (multicellular) animals. Plants have something similar (PMID: 24808902), but clearly seem to derive from a separate evolutionary origin. The jury is still out on unicellular eukaryotes, but yeasts (S. cerevisiae) do not appear to have lamins. Why not? Dunno. 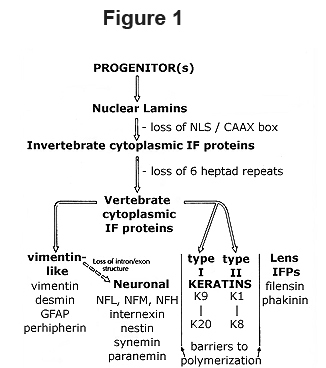 There are two types of lamins in vertebrates – A types and B types. There is a division of labor between them, but it is not altogether clear what that is. B type lamins are often described as the “house-keeping” lamins, the ones that are used mostly for structural purposes. Indeed, the B types tend to localize more typically at the nuclear envelope, whereas the A types appear to have both a nuclear rim and interior localization. For the most part (that being the number of genomes that have been investigated) invertebrates make do with B type lamins alone. EXCEPT in Drosophila, where there are two lamin genes – one encoding a putative B type, and the other a putative A type. 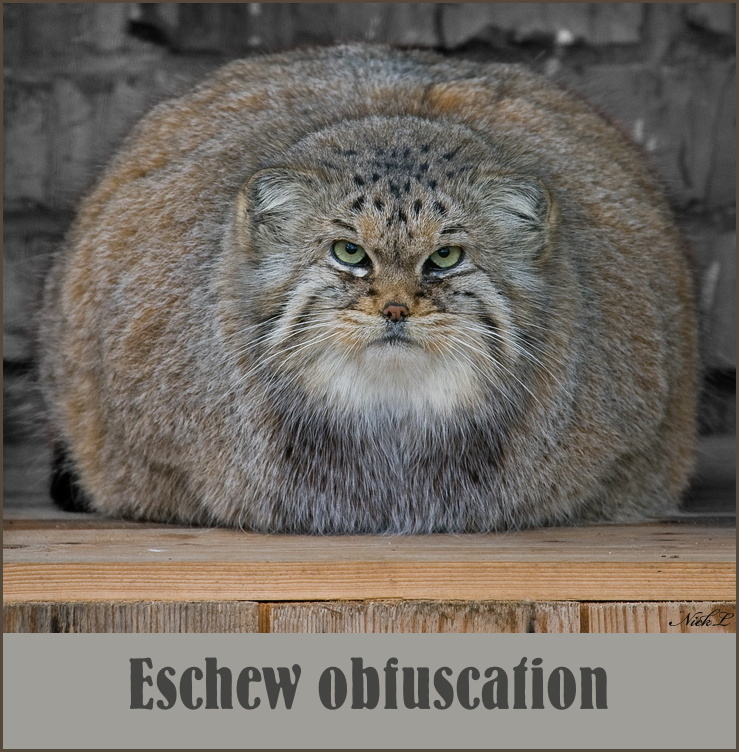 Why this exception (and is it an exception?) is unknown. Look HERE for a confocal image of A and B type lamin localization in Drosophila. So what is the difference between A and B type lamins? (Apart from localization). There are some chemical differences, but the most obvious structural difference relates to the C-terminal portion of the protein. Lamins with a particular sequence of amino acids at the C-terminus – a so-called CAAX box– are subjected to post-translational modification: the addition of a hydrophobic membrane anchor consisting of a fatty acid derivative called a prenyl group. CAAX stands for 4 amino acids: cysteine (C-), followed by two aliphatic (i.e., not aromatic, no benzene rings) amino acids (-A-A-), followed by (almost) any amino acid (-X). The prenyl anchor is affixed to the cysteine, and then the –AAX is cut off by a protease, and the resulting exposed hydroxyl group is methylated. Once prenylated, the B type lamins are incorporated into the nuclear lamina, accounting for the peripheral localization I mentioned earlier. 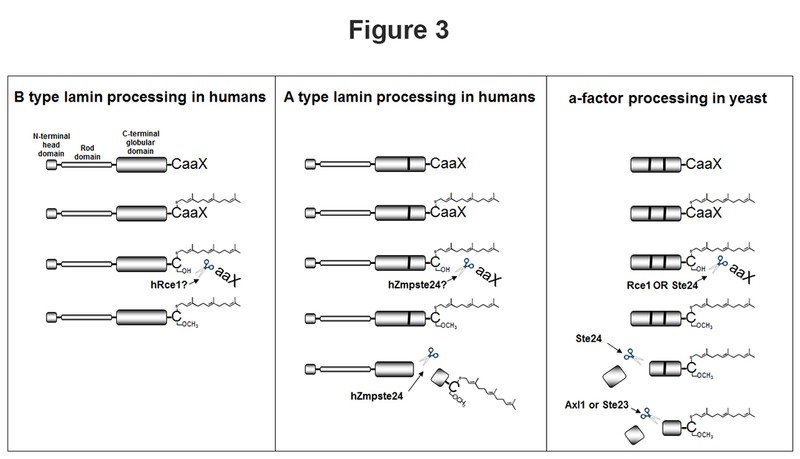 Humans have two B type lamin genes, both encoding CAAX-box containing lamins, both prenylated. Drosophila has one B-type lamin – called Lamin Dm0 – prenylated. The story is more complicated for A type lamins. Humans have one A type lamin gene, but there are two main transcripts expressed from it. They are both identical except for the very end of the message – one transcript gives rise to a lamin with a CAAX box – this is Lamin A – and the other message has an alternative 3’ exon that does NOT encode a CAAX box – this is Lamin C. In figure 2, I have tried to show this arrangement by matching up the protein domains and laminopathic mutations with the corresponding genomic and primary transcript regions. The vast majority of mutations are point mutations (only a handful are shown here), causing single amino acid changes, and the majority of diseases are various kinds of muscular dystrophies, which spawned the “mechanical stress hypothesis” – that tissues under mechanical stress are more likely to suffer due to nuclear lamin defects. Lipodystrophies (affecting fat tissue) and premature aging of course do not fall into this category. So. Two A type lamins in humans, and one of them is prenylated, like a B type lamin. And therein lies the problem. Or potential problem. Whereas B type lamins are stably prenylated, A type lamins aren’t. What? Yes, here is the weird part. Lamin A is first translated into a protein called prelamin A, which gets prenylated, and incorporated into the nuclear lamina. But then, after Mother Nature goes to ALL the trouble of linking the prenyl anchor (requiring one enzyme), and trimming the –AAX (requiring a second enzyme) and methylating the terminus (a third enzyme) the entire anchor is removed! The final processed protein is called Lamin A. This additional processing seems very wasteful. Does it make any sense? To make matters worse, if this final cut does not take place, if the prenyl anchor is NOT removed from Lamin A, if Lamin A is now stably incorporated into the lamina, the result is the premature aging disorder HGPS. So here is the puzzle: why does a mutation that produces a stably prenylated A type lamin cause rapid and systemic aging? So those are the facts, ma’am (or sir). Or some of them, anyway. Here are some more Interesting factoids. The single celled eukaryote Saccharomyces cerevisiae – used in biolabs, breweries and bakeries the world over – does not have lamins, as I have mentioned, but DOES have a very similar prenyl processing pathway. Yeasts come boy and girl versions which look indistinguishable (well…THEY can tell) and they hook up using pheromones. One of these pheromones is processed much like prelamin A – a longer protein is prenylated, trimmed, trimmed, and trimmed again: see Figure 3. In yeast, the prenylated bit is what matters – this is secreted as a mating signal. With Lamin A, though, people tend to focus on the now unprenylated lamin left behind. (Though I have always wondered if there is in fact a function for the prenylated bit. There was ONE paper that tried to address this question but I cannot find it anymore – any information on this would be greatly appreciated). You can see the history of the connection between the pheromone and lamin pathways echoed in the gene nomenclature: the Type I prenylprotease in yeast is called Ste24p (Ste for sterile – mutations first isolated based on a sterility phenotype – no pheromones, no nooky) and Zmpste24 in mammals – for Zinc Metalloprotease ste24. So there you have it, another one of Mother Nature’s retooling specials. She has to make a pheromone, so she trims a precursor in this specific way, and then, in a completely different evolutionary lineage, grabs the same pathway to make an intermediate filament protein fit for…well, fit for what exactly? Why does prelamin A go through all this processing? Where is it going that it needs all this trimming and fussing? So many steps…and perilous when you examine the consequences for disease. For HGPS, the mutation in the gene is a classic example of why “silent” mutations are not always so silent. The vast majority of HGPS mutations are glycine to glycine changes – GGC to GGT – which at the nucleotide level produces a splicing consensus that is BETTER than the native one, with the result that part of an exon is skipped in frame, and the resulting SHORTER protein (called Progerin) is now missing the proteolytic cleavage recognition site for the Zmpste24 prenyl protease, whose job it is to remove the prenyl anchor. Take a look at Figure 4. Interestingly, this region in the Lamin A/C gene is susceptible to the same cryptic splicing in otherwise normal cells from aging individuals (PMID: 16645051), perhaps triggering a cascade of events characteristic of normal aging, that are so vastly accelerated in HGPS. So…here are some open questions. Are Lamin A and Lamin C functionally redundant? Looks like it – since the mouse can get away with a gene solely encoding Lamin A or Lamin C. Flies in this respect are very efficient – their putative A type lamin gene does not encode a CAAX box at all. But there may be specific functions for Lamin A and C in vertebrates yet to be uncovered. Or, the elaborate processing of prelamin A is superfluous. According to the authors of this review: “Given that the prelamin A processing pathway is evolutionarily conserved, we believe that it is overwhelmingly likely that the pathway serves some important function. At this point, however, current evidence suggests that the prelamin A processing pathway is largely dispensable, at least in laboratory mice.” Yes, this elaborate processing pathway appears to be highly conserved in evolution, but does that always imply functional importance? Remember the adage: evolution is not a German engineer making a Mercedes, but a teenager with no money and a broken car. It is equally plausible to me that this messy pathway has been retained because for SOME reason, Mother Nature needs a non prenylated lamin in (mostly) vertebrates (Lamin A or C will do), and from an evolutionary point of view, it is harder (riskier) to mess with the DNA blueprint and get rid of the gene sequences encoding the CAAX box on Lamin A, and easier to use existing (protein) machinery to mop up the mess afterwards, i.e., post translationally. Another example of what I like to call unintelligent design. 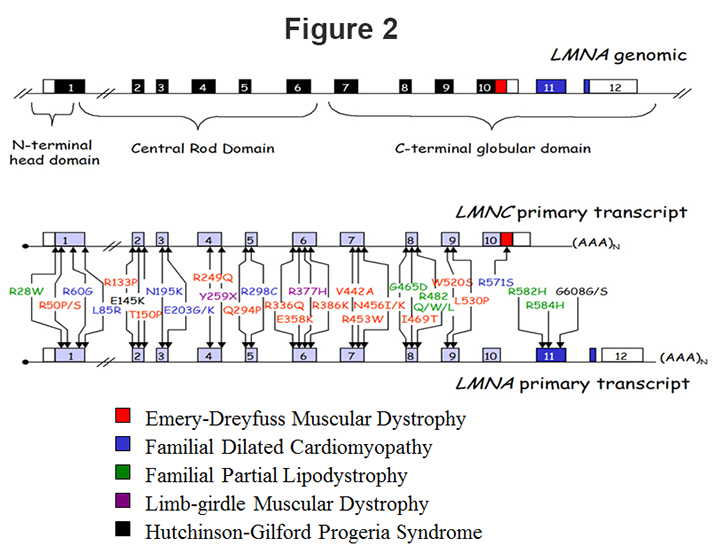 I have not discussed other laminopathies here, but do the muscular dystrophies, cardiomyopathies, lipodystrophies and the like occur due to a loss-of-function (LOF) mechanism or a gain-of-function (GOF)? Looks like LOF since the Lamin A/C gene appears to function dominantly in a haploinsufficient manner in these diseases. You can read all about them in the review I mentioned earlier (PMID: 19587450 and papers from the same issue). Is Progeria solely the result of a GOF or “toxic protein” mechanism, due to the stable prenylation of Lamin A? Maybe. But maybe not. A so-called secondary laminopathy (i.e., not involving lamins directly) was discovered that produces a severe disorder known as Restrictive Dermopathy (RD). This disease is neonatally lethal, and found to be caused by homozygous recessive mutations in Zmpste24 (PMID: 16297189). RD also arises in humans as a primary laminopathy, with splicing mutations in exon 11 of the Lamin A gene, similar to HGPS (PMID: 15317753). Interestingly though, the RD splicing defect causes a 90 amino acid deletion in Lamin A, while a smaller deletion of 35 amino acids in the same region is associated with an exceptionally rare mild form of HGPS diagnosed in a patient who was 45 years old (PMID: 15121795) (The HGPS deletion is 50 amino acids). Thus, mutations leading to progeroid symptoms can follow an allelic series of varying severity that have in common failure to fully process prelamin A. These observations suggest that loss of the Zmpste24 cleavage site is a factor in disease etiology, but so is the size of the deletion. 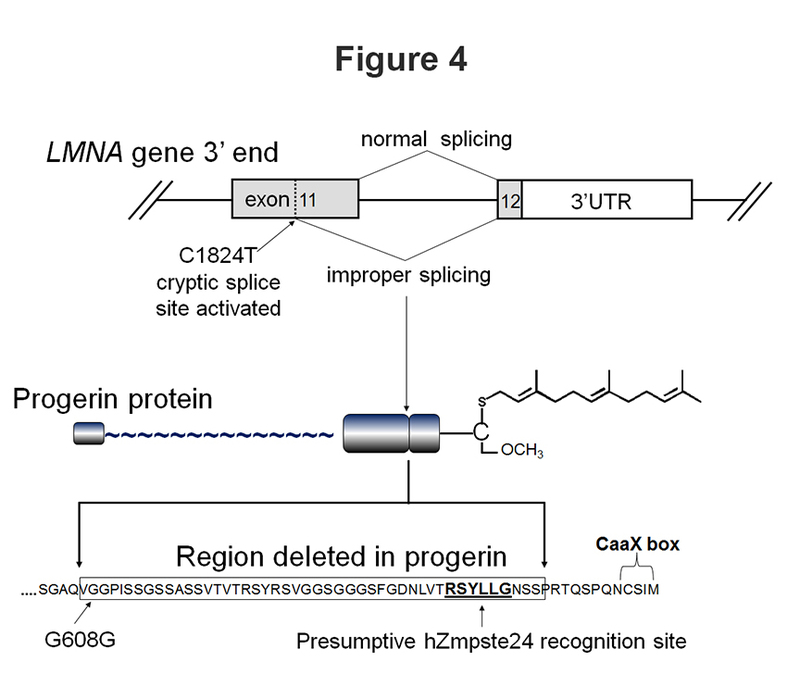 Also, if the mouse produces an UNPRENYLATED version of progerin (remember, progerin is the shorter version of Lamin A, with the in-frame deletion) the mouse gets Progeria (though not as severe: see part I of Figure 5). Underneath all these dreadful diseases and complex processing pathways is a central question. If I were writing a grant or a paper, I would use suitably professional yet portentous language, but since I am writing an obscure blog, I will simply ask this: Why does Mother Nature need an unprenylated lamin? And since the consequences of Progerin are so prematurely deadly, and since a similar protein shows up again in normal aging cells, is an unprenylated lamin a key to the secret of eternal youth? Wouldn’t that be nice. And how am I going to incorporate ANY of this stuff into a fly model? Stay tuned!